When choosing the right flexible packaging for your products you need to take several variables into account. In addition to meeting merchandising and display goals, proper packaging can help maintain shelf stability, provides for efficient shipping and optimize merchandising. While certain types of packages are associated with specific products, you may have more than one viable option when bringing your goods to market. Pouches, for example, furnish flexible packaging solutions for a variety of dry and liquid goods and often a great alternative to rigid packaging such as bottles or canisters. In addition to small retail footprints and flexible merchandising options (hang, stand-up, multi-pack), pouches are easier to pack and ship than other rigid items, saving you money on freight and distribution. If you think you might benefit from a modern pouching solution, consult with us through a call or directly via sales@assemblies.com to explore state of the art gusseted options. Experienced packagers are capable of taking your project from conception to completion, sourcing suitable materials and providing a variety of design possibilities. Gusseted examples furnish adaptable solutions outfitted with expandable folds designed to accommodate wide-ranging contents for various product bulk densities. In addition to their ability to expand around bulky and irregularly shaped products, gusseted pouches furnish printable panels for sending your marketing messages. Once your gusseted pouches are properly sized, eye-catching graphics can be incorporated into your design along with clear panels to view your ingredients. Bottom Gusset Pouches – This popular pouch style uses an expandable gusset on the bottom, which often creates a stand-up presentation when filled. The flexible alternative employs zipper closures on top, allowing users to reseal pouches between uses. Snacks like sunflower seeds, trail mix, pancake mixes, nuts and popcorn kernels are widely packaged using this approach, as well as candy and gummies. Cake mixes and other powdered goods are also well suited for stand-up bottom gusset packaging. 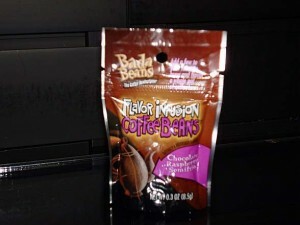 Side Gusset Pouches – Currently serving as the industry standard for packaging coffee, side gusseted pouches employ folds on each side, which expand when filled with beans or ground coffee. The shelf-stable units are sometimes outfitted with breathable vents and metal ties for sealing them between uses. Generally made of foil material, they can be color matched to your brand and/or outfitted with your proprietary graphic illustrations. 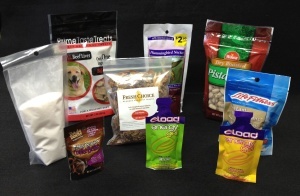 Pouch sizes vary from several ounces to multiple pound versions, accommodating diverse contents, including powdered goods and dry pet food. Whether you are packaging liquid or dry food products, professional packagers have gusseted pouch options available to serve your needs.